Five Stars Yelp Reviews – Fair Prices, Fast, Good Service! 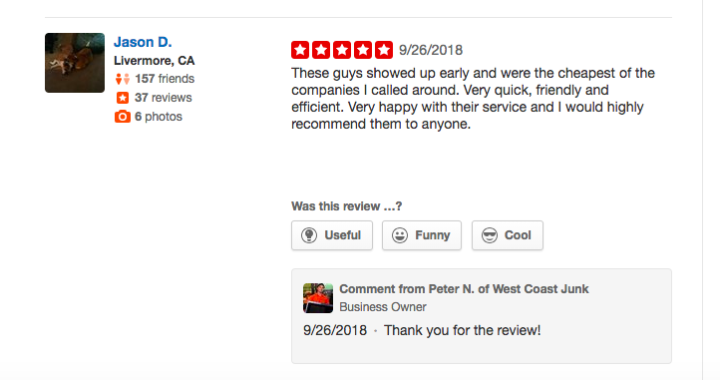 Our clients love us on Yelp! We have a five stars Yelp rating, and the most common things people rave about it is our service, our speed, and our fair prices. Read what people are saying, and then call us to find out for yourself! West Coast Junk is a prime example of customer service and efficiency at its best! My roommates and I cleaned out our yard and garage this morning. We had a lot more junk than expecting so we reached out to a couple companies for quotes to pick it up for us. West Coast Junk replied within minutes and gave us a rough quote by photo we sent, and said they could be here in only 2 hours to come pick everything up! Not to mention their quote was the most fair of any we had received. 2 hours later two guys arrived on time and cleared out our pile in less than 20 min. They were so friendly and their exact quote matched the one they estimated from the photos. Woo! I couldn’t be happier we went with West Coast Junk, and I am happy to recommend them for your junk hauling needs. I called Peter and David to haul away a broken refrigerator from my home. Peter quoted me a reasonable price for the job. On the day of the removal, David and Peter showed up on time. They are very nice, polite and professional. They are hardworking people and they do their jobs very fast. I definitely recommend them if you need hauling away junk. I will call Peter and David again if I need hauling services in the future! These guys are so awesome, I actually used them twice! 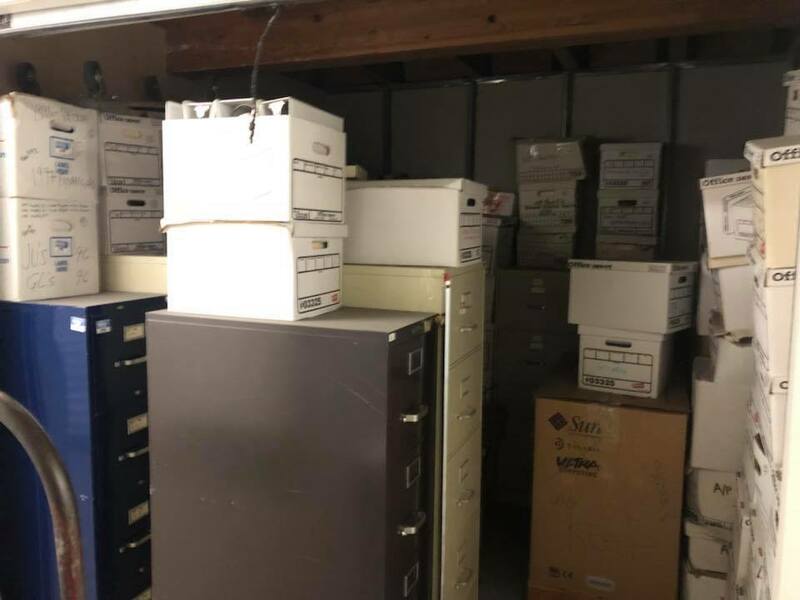 My mom’s 10×10 storage unit had to be emptied, and after 6 years of not being opened, I was overwhelmed at finding lots of furniture and dusty boxes. I gave these guys a call, and they were able to show up the same day. Their quote was pretty reasonable and they worked quickly to get everything loaded up and hauled away. The second time I used them, they hauled away more furniture items, and accommodated me when I found more items that I didn’t need but weren’t part of the original quote. They even helped me load up a U-Haul and swept up before they left! David and Peter are good guys in every sense of the word – honest, hardworking guys. They’re fair with their pricing and get the job done quickly and efficiently. They are responsive with great communication, updating me as to when they’d arrive or if they could meet me earlier than scheduled. Other businesses I called never even got back to me with a quote. I would use them again in a heartbeat, and would recommend them to other friends and Yelpers looking for great service. Five stars Yelp. The service from Peter and his crew is outstanding. Communication was top-notch. I got the lowest rate from him and he got me in the same day! He also honored a coupon on top of his low rate! They arrived at my home when I wasn’t there and waited when it was a small job to be done. He’s got my repeat business should I need it again. I can’t say enough positive things about WCJ. Thank you!! Wow! Amazed at the professional service from Peter & driver (didn’t catch his name). I would highly recommend their service. I was really impressed by the super fast online Yelp response & quote plus coordination of a pick-up time the very next day. The arrived promptly as promised, were professional & courteous. They completed the work as promised & left the garage & driveway spotless. Thanks West Coast & Peter for a job well done! These guys showed up early and were the cheapest of the companies I called around. Very quick, friendly and efficient. Very happy with their service and I would highly recommend them to anyone. David and Peter came within the HOUR we called! Their service was quick and so professional. Very friendly, and excellent service! Highly recommend this place if you need to haul anything! They’re excellent. 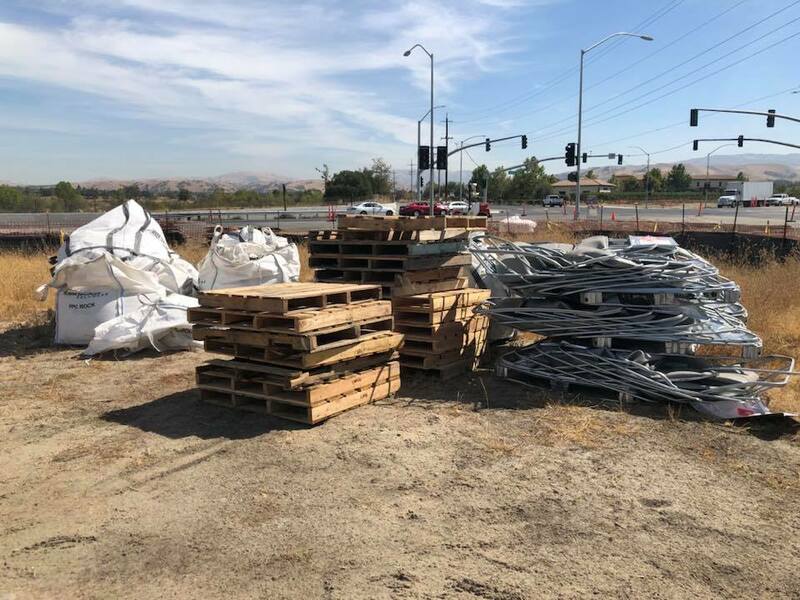 If you have a storage unit or garage to clean out, construction debris or electronic waste, give West Coast Junk a call at (925) 785-6726 today to have our respectful and professional team haul it away for you, and experience our five stars Yelp service for yourself! We are based in Dublin, CA and serve the greater San Francisco Bay Area, including San Jose and the Silicon Valley. Where Can I Dispose of My Old TV? Our junk removal and trash hauling service area includes these cities: Alamo, Berkeley, Campbell, Castro Valley, Concord, Cupertino, Danville, Dublin, Fremont, Hayward, Lafayette, Livermore, Los Altos, Los Gatos, Martinez, Milpitas, Moraga, Mountain View, Newark, Oakland, Pleasant Hill, Pleasanton, San Francisco, San Jose, San Leandro, San Ramon, Santa Clara, Saratoga, Sunnyvale, Tracy, Union City, Walnut Creek. See a full list of cities in our junk removal and trash hauling service area. Don't see your area listed? Call us to check availability. Featuring professional junk removal service for Dublin, San Jose and the greater San Francisco Bay Area. © 2019 West Coast Junk | 3277 Monaghan St, Dublin, CA 94544 | (925) 785-6726 .